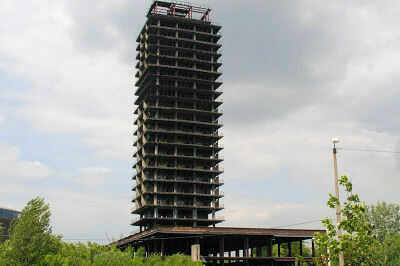 Szkieletor is the unofficial name of a 91 metre high highrise building in Kraków, Poland, originally intended to become headquarters of Naczelna Organizacja Techniczna. The construction of the building was started in 1975, but was stopped in 1981, because of economical reasons. Due to the unfinished building's resemblance to a skeleton, it was nicknamed after Skeletor, arch-villain in a 1980s cartoon, He-Man. In recent years, several investors were interested with the building, but they became discouraged with complicated legal status of the parcel it stands on, as well as high cost of its demolition or adaptation. It is located near the Rondo Mogilskie and Cracow University of Economics. At present it is the tallest building in the city. Info from Wikipedia. Thanks to Rob Williams, Vancouver, BC, Canada, for guiding me to the Szkieletor.